A “mega church” typically has a weekly attendance of more than 2,000 people. Although these large congregations make up only a sliver of the church-going population in the United States, the number of mega churches has doubled in the past five years to over 1,200, and they have become an influential part of the cultural landscape. In one sense colossal churches are nothing new, since large cathedrals have been built for centuries—St. Peter’s Basilica in Rome, for example, accommodates 60,000 people—but the contemporary mega churches represent a dramatic shift in terms of architectural style and the kind of experience they provide. 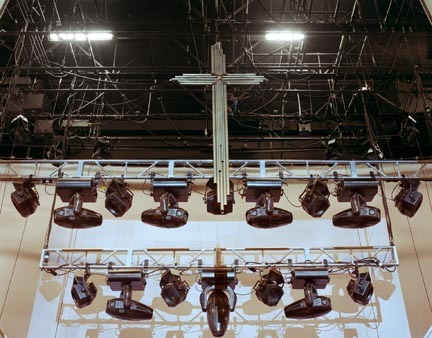 Joe Johnson has traveled to mega churches throughout the country to photograph their empty interiors and behind-the-scenes spaces. His photographs convey the scale of the church buildings and document their emphatically secular designs, often modeled after theaters, stadiums, or community centers rather than traditional religious buildings. 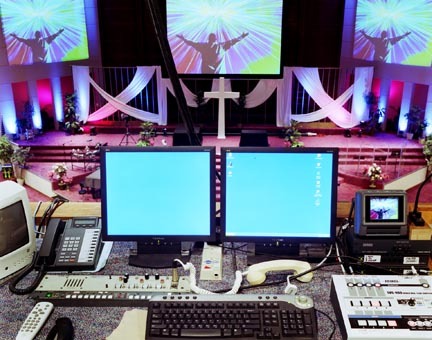 In a more pronounced way, Johnson zeroes in on the technology, computer control rooms, and elaborate stage sets that shape the worship experience. Big video screens and stacks of sound equipment anchor many of his compositions. 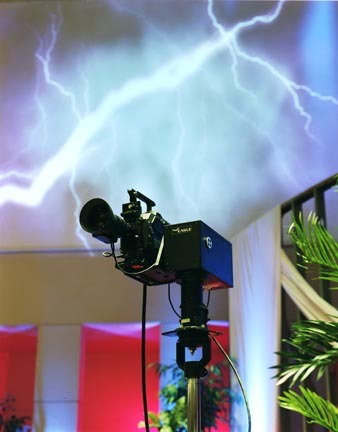 Pragmatically speaking, all this hardware and media technology allows for thousands of people to be engaged in the service, but the lurid colors, bright lights, and big constructions that fill Johnson’s images hint at elements of spectacle and showmanship as well, even in the hushed absence of people. Johnson completed a BFA at the San Francisco Art Institute in 2001, and an MFA at the Massachusetts College of Art, Boston in 2004. His photographs have been exhibited at the Beach Art Museum at Kansas State University; the DeCordova Museum and Sculpture Park, Lincoln, Massachusetts; the Bonnie Benrubi Gallery, New York; and other venues.